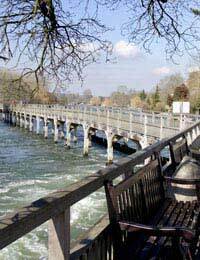 From its source in the Cotswolds not far from Cirencester, through the Chilterns and onwards into the heart of London until it ends at the Thames Barrier near Greenwich, the Thames Path follows England’s most famous river for 184 miles from beginning to end. It gives walkers the opportunity to combine a hike that is rich in beautiful countryside and wildlife, stopping off to visit smaller picturesque villages along the way before encountering the hustle and bustle of the nation’s capital city. The walk is not as physically demanding as some other walks mentioned in this section and can be enjoyed by walkers of all abilities and ages. There are linear walks taking you from point A to B and also circular routes for those who may wish to simply hike a section of the route and return to the place they started from. Certain sections have stiles that you’ll need to get over but there are other sections which are ‘user friendly’ for people with mobility difficulties or if you’re walking with a young child in a pushchair so, with no significant steep sections or undulations, the Thames Path has something to offer everyone. Although most people will complete the walk by breaking it down into different sections over a period of time, the more rigorous hiker can complete the path in one go over a period of about 2 weeks, based upon walking around 13 miles a day. This timescale is during the summer months as several stretches of the path can often become bogged down and flooded after heavy rainfall, especially in the winter when certain sections can become impassable where the river may have burst its banks. If you’re walking in the opposite direction and heading out of London, your first experience is likely to be one of wanting to stop off frequently as there are so many interesting things to see and do. There’s the Cutty Sark, Tower Bridge and the London Eye within the first 8 miles or so. You’ll also follow the route taken in the famous traditional Oxford and Cambridge Boat Race. Reach Kingston-upon-Thames and you’ll get to experience the splendour of Hampton Court Palace after which your walk will start to take you away from the last of the capital’s suburbs and out into more picturesque and peaceful countryside. There’s still Windsor with its famous castle and Runnymede where the Magna Carta was signed. Heading west, there’s the pretty village of Cookham and on towards the beautiful towns of Marlow then Henley-on-Thames, famed for its annual regatta. You’ll then experience some of nature’s finest scenes as you head on into the Chilterns before the path meets up with the Thames again. You can visit the historic town of Dorchester and there’s Abingdon too, if bustling market towns are more your thing. All this leads to a trip to Oxford, the ‘city of dreaming spires’ and famed the world over for its academic and historic importance. After which, there’s plenty of lovely open countryside to enjoy before the walk links the two Cotswold towns of Cricklade and Lechlade-on-Thames where you can soak up the nature all around you. Finally, the path passes into the Cotswold Water Park before heading into beautiful Ashton Keynes. Towards the very end, you’ll pass through the villages of Somerford Keynes, Ewen and Kemble until you reach the stone that marks the source of the River Thames and which signifies the end of the Thames Path – or the beginning, if you’re hiking in the opposite direction. As the Thames Path meanders through many small towns as well as the capital, getting there is very easy wherever you choose to get on the path. National Rail stations can be found in many of the towns on route and, nearer the heart of London itself, you can also use the bus and tube networks also to access sections of the path.